Wise men become fools to escape excessive demands in this Estonian import. The male Gothamites of Turkeyland, renowned for their wisdom, travel extensively, advising foreign heads of state—while their homeland, run by the womenfolk, falls into chaos. The desperate women plead for them to return, and upon doing so, the men decide that they must behave stupidly so their services will no longer be desired outside of Turkeyland. Ten short stories follow in the best noodlehead folklore tradition: A group of fools with tangled legs cannot get up because they don’t know which feet are theirs; another one attempts to catch light in a sack. 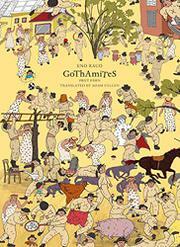 The richly colored, Brueghel-like illustrations feature intricate, comical scenes of the Gothamites in all their splendid incompetence (and cheekily tuck in a hammer and sickle). In keeping with the sexism of the text, the big-bosomed and -bottomed women are clad in slip dresses even in the dead of winter; the men are modestly attired. Turkeyland seems to be Northern European, and all characters appear white apart from one black boy wearing a sweatsuit. The lengthy text and small-scale illustrations make this suitable for independent reading or one-on-one sharing. It may appeal to readers who enjoy the absurd and the slapstick, although many stories feel too long, diluting the impact of the humor—the printing of page numbers upside down underscores the loopiness.